Our contracts are flexible and comprehensive, covering virtually all hardware and software, connectivity like leased lines and ADSL. This gives you a single point of contact and a one-stop support solution. We'll be there when you need help. The backbone for almost any IT solution today is a robust high-availability network. That means your network, including every node on it, must be reliable, available, secure, scaleable and meet all your functional needs for Internet (intranet/extranet) connections, traffic levels and resource sharing. 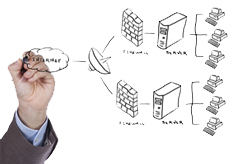 Micro System Solutions Pte Ltd considers all of these factors in any network solution we provide. All the interoperability required for any combination of these platforms in a multi-vendor environment.